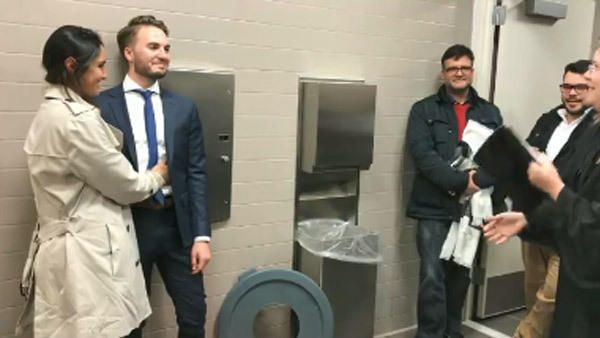 FREEHOLD, N.J. -- A New Jersey couple recently changed their wedding venue from a judge's chambers to a courthouse bathroom after a relative had an asthma attack. Brian and Maria Schulz were set to tie the knot on Jan. 2 when the groom's mother had difficulty breathing. She was taken to a women's room at the Monmouth County Courthouse, where sheriff's officers administered oxygen and called EMT's. If they had postponed the wedding, they would have had to wait 45 days for a new marriage license. So one of the officers suggested holding the ceremony in the bathroom. In a video posted on the sheriff's office Facebook page, Judge Katie Gummer performed the ceremony. The groom's mother is doing fine.